Were you here ten years ago when we re-introduced you to Wisconsin’s Elaine Kramer and her six horse roman riding act? At that Saturday evening performance, we showed a video of Elaine and her horses performing. You cheered so loud when you saw her go over the double jump that the Coliseum roof rose! The Horse Council recognized Elaine in splendid fashion with a ride atop of a grand coach pulled by the Cox family’s regal four horse Friesian hitch. If you were here, you remember. Elaine said that “when she heard that crowd roar, it felt like it was 30 years ago” when she was in show business and still performing. Back in 2005 we asked you to write letters to the National Cowgirl Hall of Fame supporting her nomination. Your response was overwhelming. The museum director in Fort Worth, Texas said she’d never received so many letters for a nominee. The selection committees agreed that Elaine must be honored. 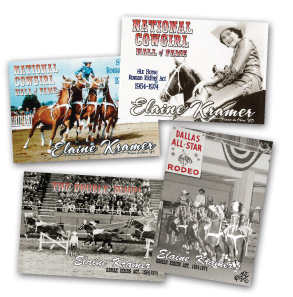 In October, 2005 Elaine was inducted into the National Cowgirl Hall of Fame. More than 100 of Elaine’s fans, many from Wisconsin, joined her for the ceremony. In 2006, Elaine came back to the Midwest Horse Fair to thank you for your support. You raised the roof again. This year, on the 10th anniversary of her first appearance here and her induction, Elaine wants to thank you and the Wisconsin Horse Council again for giving her a truly awesome return to the spotlight! Wisconsin native Elaine Kramer turned a childhood love for horses into a show business career that spanned 20 years. In her Roman Riding Exhibition, she rode six matched Saddlebred horses in circles and figure eights at incredible speed, then over a series of jumps – all while standing on the backs of the last two horses! She was a top performer on the rodeo and horse show circuit in the 1950’s, 60’s and 70’s, where she thrilled audiences at every major show in the USA and Canada. To purchase a copy of Elaine Kramer's video Dreams to Reality, please contact Carolyn. The cost is $12 and includes postage and handling.